With this outdoor dining table you will be able to create a peaceful haven that offers a vibrant touch to your garden space. This single chair set features a rectangular table, along with six chairs and 4 stools, allows for a large gathering of family and friends. This complete set offers a modern look and can be used both outdoors and indoors. Along with the versatile design, the dining set offers a comfortable seating for all your guests. The table is manufactured using quality materials that ensure both comfort and reliability in the long run. 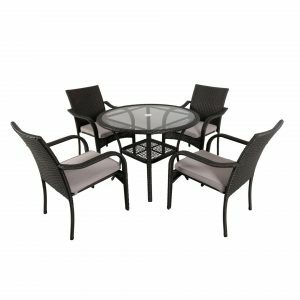 So you do not have to worry about a thing when it comes to this gorgeous dining set for your patio. This stunning table offers an appealing look that add character and design to your outdoor space. 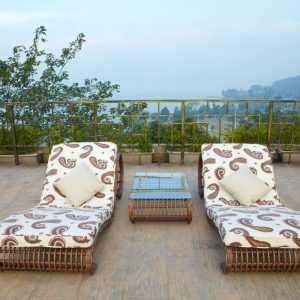 So you do not have to worry about breaking away from them of your home while enjoying a luxurious outdoor dining table. Along with great comfort and design, you can easily move it around, and keep things light and easy going. Each chair and stool features a comfortable and easy to clean cushion that offers great seating for long hours. Allowing you to keep the party going for as long as you like. The rectangular table can easily store the extra stools under its hood, allowing you to keep a simple and clean looking backyard at all times. Moreover, the set can easily be cleaned with a damp cloth and does not require any additional upkeep. Finally, you have a piece that fits and looks amazing in your backyard. As this unique piece will help set the perfect tone while keeping things according to the rest of your furniture. To help make this dining table an easy to blend furniture piece, we offer a dark brown base color that can easily be paired with other neutral or statement pieces.